Home News Kids For A Quid! 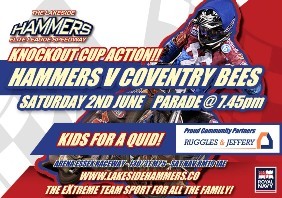 On Saturday 2nd June at the start of half term week and then throughout the school summer holidays, entry to the Lakeside Hammers Speedway Meetings will be just £1 for children. This initiative is sponsored by Ruggles & Jeffery as part of our Community Partnership with the Lakeside Hammers. Speedway has become increasingly popular in recent years and Essex’s own Lakeside Hammers is now one of the leading teams in the Elite League. Speedway is a great family occasion with 15 races in every meeting creating lots of noise and excitement. The top riders come from across the globe and meetings are now regularly shown live on Sky Sports TV. The meetings are held at Arena Essex and are a wonderful way for parents, children and friends to spend time together at the weekend.